Now more than ever, adults can take advantage of modern dentistry to achieve a perfect smile. In fact, adult braces are a trending orthodontic treatment to achieve a pearly white smile. If your dream is to have brighter, straighter teeth, don’t be turned off by the idea of adult braces. You may think the time for fixing your crooked or crowded teeth has come and gone, but you’re wrong. Whether you are unhappy with your smile or suffering from a poor bite causing wear and tear on your teeth, Heroes Dental has the solution for you. A common misconception many people have regarding orthodontic treatment is that braces are not as effective on adult teeth. The belief is that an adult’s teeth will not move as easily as a child’s or teenager’s. While it is true that younger children and teens have much more pliable bodies, this factor does not in any way change the effectiveness of orthodontic treatment for adults. Length of treatment, however, may be affected. An adult and teenager have similar crowding issues. The length of treatment for the adult may be 22 months while the adolescent will only need to wear braces for 18 months. Both patients will have achieved the desired outcome – just at different time frames. Adults tend to be more responsible and compliant to rules regarding their orthodontic treatment. Because significant changes need to be made your dental hygiene routine when wearing braces, younger individuals may forget or feel lazy about properly caring for braces. Adults, on the other hand, have a better understanding of the financial investment that is involved with braces. The decision to get braces as an adult is also a very intentional move. As an adult, you are more likely to do exactly what it takes to achieve the best results from your treatment. An adult will invest plenty of time and effort to ensure they are receiving the best treatment for their budget and lifestyle. Years ago, wearing braces meant dealing with the inconveniences of bulky and unsightly metal bands. Today, metal braces are less intimidating. Now, metal brackets are made of a high-grade stainless steel, which are cemented to the front of each tooth and connected by a single wire across the bottom and top. 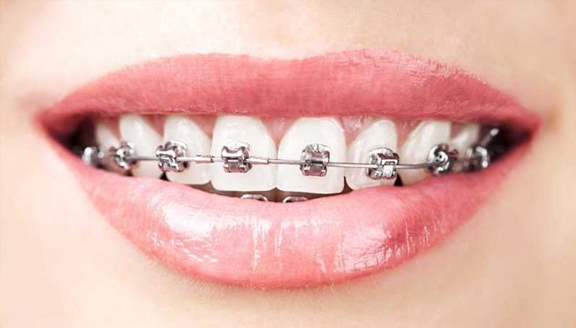 Metal braces may not be visually appealing for most adults but they are a heavy-duty and less expensive treatment option for achieving straighter teeth. Clear braces are much like traditional metal braces except these are made of a transparent ceramic material. This means the individual brackets are less visible to the outside world. While they are slightly more expensive, clear braces are a common alternative to metal braces. Adults can opt for clear, pearl, or white-colored elastic bands (ligatures) to enjoy a fully concealed look. Treatment times for any of these options will vary depending on your individual dental needs. Whether you are looking for traditional or clear braces, Heroes Dental will help develop the perfect orthodontic treatment plan for you. Braces are now cheaper and better-looking. If you never got braces as a teenager simply because it didn’t fit into the family budget, now is the time to take advantage. Whether you opt for the more budget-friendly metal braces or you go for the inconspicuous clear braces, advances in modern dentistry and orthodontics have made each and every treatment option an appealing, comfortable, and cost-effective choice. Braces can help you avoid dental problems and other health issues.A misaligned bite and crooked, crowded teeth can lead to dental problems and overall health issues over time. Because people are living much longer, the resulting problems of poor dental care can become cumbersome before you know it. Have you noticed that you are not chewing food properly, are unintentionally biting your cheek, or are you feeling jaw pain and having headaches often? These are all tell-tale signs that the state of your dental health may not be ideal. Teeth can shift at any age. You may have had perfectly straight teeth in your childhood but there is no guarantee that your teeth will remain completely upright throughout adulthood. If you have noticed some crowding lately, don’t be alarmed. Healthy teeth can move at any age, even after orthodontic treatment. You may simply be facing natural changes to your mouth and jaw. Invest in your health and happiness with orthodontic treatment from Heroes Dental. Adult braces are truly an investment for better health and happiness. Now that braces have the potential to be more convenient, comfortable, and virtually invisible for your lifestyle, there is nothing holding you back from a perfect smile. Schedule an appointment today at one of our Rio Grande Valley locations in Laredo, Mission, San Juan, Pharr, or Edinburg. At Heroes Dental, we will take aesthetic, cost of treatment, and lifestyle preferences into consideration when deciding on the best orthodontic treatment option for you.